meetings on alternate months: on 3rd Wednesday at 7:30 pm of Feb, April, June, Aug, Oct and December. Locations vary – see the meeting and event calendar of this club website. Club members receive timely e-mail with meeting location and agenda information. COARA sponsors two Saturday swap meets each year. Past swap meets regularly attracted folks from outside central Ohio and from neighboring states. Outdoor parking lot swap meets are now held late Spring and early Fall, typically May and September at a church parking lot with an adjacent shelter in the Columbus suburb of Westerville. Details are announced on this site and are sent to members and to non- members on our mailing list. Club meetings are informal. Topics vary and may have a theme. Restoration discussions are frequent. 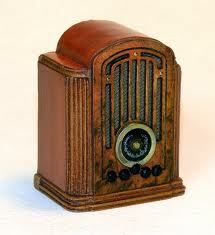 We encourage bringing a radio or radio related item for “show and tell”. We mention nearby events of interest. Club member benefits include acquaintance with other members, the sharing of information and advice, preferential seller fees at our swap meets, email notification of buying opportunities that become known to the club … and the preservation of this club for our mutual benefit. Scott Freshour or Barry Gould with your complete mailing information and your e-mail address.